Win an Eglu Cube for your Mum this Mother’s Day! 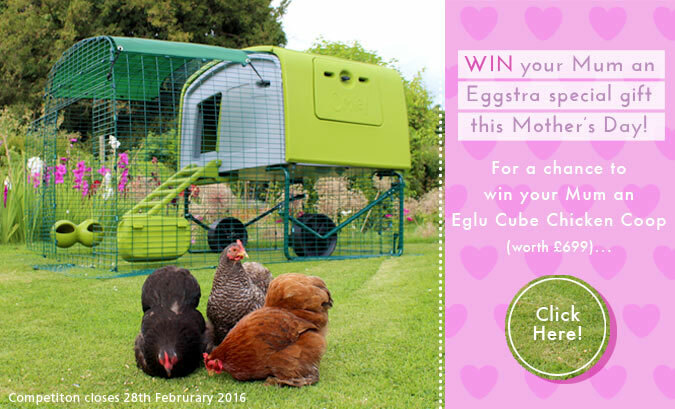 Win an Eglu Cube for your Mum! This Mother’s Day we are going to surprise one lucky Mum with an Eglu Cube Chicken Coop worth £699. The Eglu Cube is the ultimate abode for a small flock of chickens, with a private nesting box, snug roosting area and spacious fox-resistant run. It is quick to clean, easy to move and it will keep hens at a comfortable temperature whatever the weather. So, how do you go about winning this fabulous prize for your fabulous Mum? Simply tell us, in 100 words or less, why she would love an Eglu Cube Chicken Coop. Click here to enter this fantastic competition! The competition closes at 11:59pm 28th February 2016. The winning entrant will be selected and notified by email on 29th February 2016. The winning entrant will need to confirm the name and address of the prize recipient by midday on 2nd April in order for the prize to reach her in time. Delivery will be made via Parcelforce on 4th March.